The Detailer’s Helper Tool Belt is a paint-friendly, auto detailing tool belt designed to help professional and hobbyist detailers and car guys/girls work smarter, safer, and faster! Multiple pouches offer many options for holding all of your detailing supplies, tools, and equipment. 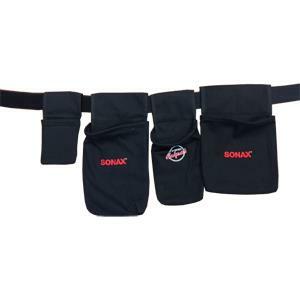 Sized to fit most SONAX bottles! The Detailer’s Helper is Made from paint-friendly, soft cotton fabric – no metal, plastic, or harsh fabric has been used. The current belt is will fit between a 42-43″ waist.